Chevy Chevelle 555 Big Block – Amazing Cold Start! - Muscle Cars Zone! Chevy Chevelle 555 Big Block – Amazing Cold Start! Owning classic American muscle car these days is something awesome. It is even better if the car you have is in pristine condition. In order for such car to be in pristine condition, it has to be restored to perfection. People restore their cars on various ways, some like to modify their car such as swapping the engine or lowering the car, whereas some want to keep the car in the original shape as much as they can get, though we must admit that swapping the already powerful engine in a muscle car for a much better one is awesome. Hereby, we take a look at this furious looking Chevy Chevelle 555 and its amazing cold start. It sounds absolutely amazing and it will make you fall in love almost instantly. Though the car is not fully complete hence the wheel is taken out and we do not actually see the car in action. We can only assume that the car is under some sort of a repair. 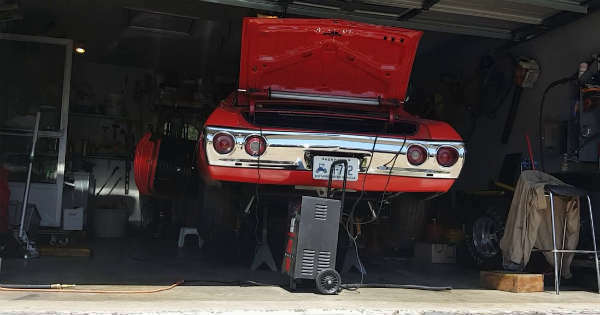 One thing is for sure, this Chevy Chevelle 555 has been restored to perfection and it looks absolutely gorgeous, even though we see just the rear part of the car. The cold start is as good as it can get. The car roars like a beast. It is so powerful that it manages to move some of the objects that stand near it. We would all love to see this awesome car in action. What do you think, could this be one of the most beautiful Chevelle`s you have ever seen?